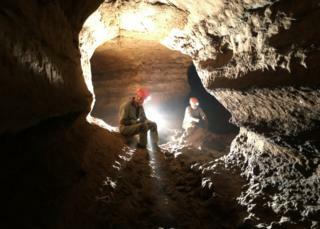 The world's longest cave in sandstone was recently discovered in India's north-eastern state of Meghalaya. Soutik Biswas joined a group of speleologists for a glimpse of this unique cave. "If you get lost inside, you may never be able to find your way out," warns Brian D Kharpran amiably, jabbing his finger at the unkempt entrance of a sinister-looking cave. After trekking downhill for nearly an hour through a forest's mossy trees and plants, we are at the mouth of Krem Puri, which translates from the local Khasi language to Cave Fairy. At 4,025ft (1227m) above sea level and overlooking a deep valley, the opening is at the base of a steep cliff. The cave is 24.5km (15 miles) long and covers an area of 13 sq km - twice the size of Gibraltar - in lush green Mawsynram, reputed to be the wettest place on Earth. Up until February, the 18.7km-long Imawari Yeuta in Venezuela was the world's longest such cave. Mr Kharpran, a remarkably agile 71-year-old banker, knows a thing or two about caves. He has been discovering them for more than a quarter of a century in this hilly, rain-drenched state. 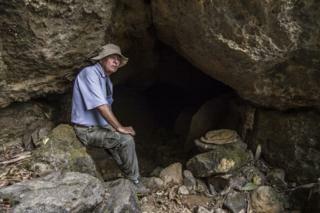 When he began exploring in 1992, there were a dozen known caves in Meghalaya. 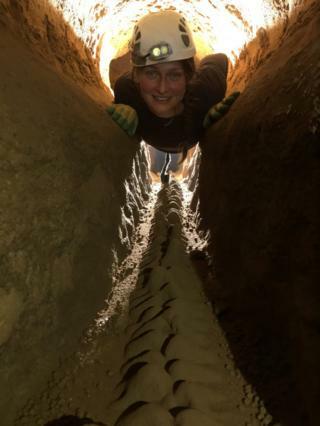 Twenty six years and 28 expeditions later, he and a 30-strong international team of cavers, geologists, hydrologists, biologists and archaeologists have discovered more than 1,650 caves in the state. Meghalaya is now known to be home to some of the world's most complex cave systems; and has more caves than any other place in India. Wearing hard hats and headlamps, we plunge into the darkness. On the left, there's a low, small passage. If you want to make your way through this claustrophobia-inducing hole in the rock wall, you need to wear caving suits so you can crawl on your belly, hands and knees. I am not wearing one, and so a "tight crawl" is completely ruled out. On the main passage, two enormous boulders stand in the way in a cheek-by-jowl formation . You can climb over or try shuffling along sideways to get ahead. I clumsily try doing both, and my shoe almost gets stuck in a treacherous looking gap between the rocks. We step over water-slicked stones, and find a faint stream. During the monsoon rains, this would possibly turn into a torrent. Mr Kharpran spots a big spider on the wall, and we also find what geologists suspect is a fossil of a shark tooth embedded in a rock. "The cave," he says, "holds many secrets." Krem Puri is an incredibly complex maze of hundreds of short passages and long stretches of corridors that are interconnected in a big network. The pattern of the maze is quite unique, and makes the cave a real labyrinth. It has some fine stalactites and stalagmites. 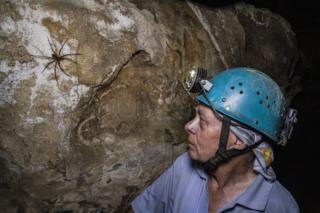 There's also abundant fauna - frogs, fish, giant Huntsman spiders, bats. "It is a serious challenge to survey this cave," says Thomas Arbenz, a Swiss speleologist and cave topographer. You get a sense of it when you look closely at the map of the cave and spot the striking names surveyors have given to passage walls, pits, ledges and large rocks on their underground journeys. The Great White Shark, for example, is an imposing, grey rock which resembles a shark and seems to float in the middle of the canyon. Brittle sandstone ledges make walking a real challenge on Suicide Ledge Canyon. The Tight Crawl and Dangerous Boulders leave nothing to the imagination. A passage called Sleepy Lunch where the tired surveyors had a lunch break - and one of them felt "particularly sleepy"- is a relief. Scientists believe that they may have stumbled on to some geological riches here. 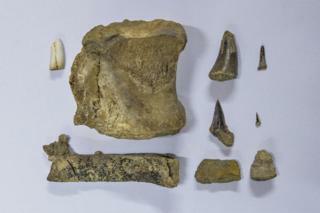 Italian cave explorer Fransesco Sauro says they have found and identified a few shark teeth and discovered some bones that "could" be related to marine dinosaurs - common animals that populated the sea more than 60 million years ago. Many of them are in areas of the cave that are extremely difficult and dangerous to reach. "There have been other features of geological and paleontological interest that have been discovered, which explorers can only reveal after they are scientifically analysed," says Mr Sauro. Did humans ever inhabit Krem Puri? Highly unlikely, say scientists, because the nomadic troglodytes generally preferred roomy cave entrances or rock shelters. Also caves that get flooded during rains are not fit for habitation, and that would mean that most caves in Meghalaya have not seen any humans living in them. 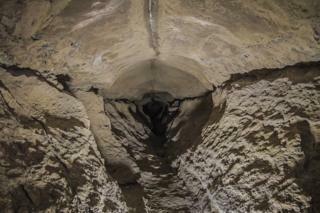 What makes this cave unusual though, is that it has been formed in sandstone. Caves are usually formed by the dissolution of limestone. Rainwater picks up carbon dioxide from the air, turns into feeble acid and dissolves the rock. Caves in sandstone are not common because the rock has low solubility. Therefore, they need high amounts of water to dissolve and erode to create underground voids. Meghalaya experiences some of the highest amounts of rainfall in the world, so experts say it is not entirely surprising that caves in sandstone can develop in such an impressive way in the state. Caves like Khem Puri are also a key to understanding climate and fauna. "They are in effect time capsules that in the often stable underground environment preserve information about the past," says Simon Brooks, chief coordinator of the Caving in the Abode of Clouds Expedition, that explores caves in Meghalaya. These "archives of the surface" preserve traces of events that happened on the surface of the planet through the ages like ice cover, volcanic activity, and floods. 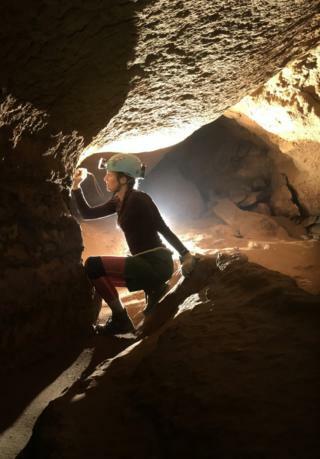 Meghalaya's caves have begun to attract explorers from all over the world. The hills are home to India's longest general cave - the 31.1km-long Liat Prah limestone cave system. Many of them are huge, and carry deep rivers. The deepest cave - the range from the highest point in the cave to the lowest - is 317m. The deepest vertical drop for cavers to abseil down is 97m. The calcite formation in many caves in the region are of "great, outstanding beauty and absolutely match the ones seen elsewhere seen," says Mr Arbenz. And despite the fact that most caves have never seen humans living in them, there is evidence of some have been used as wartime shelters, others as shelter for hunters and at least one which was used as a burial ground. A thriving coal mining and limestone quarrying business in the state poses the greatest threat to these caves. (Mr Kharpran even went to the Supreme Court in 2007 in a vain bid to stop coal mining in Meghalaya). Inside Krem Puri, the temperature is always a balmy 16-17C, no matter what the temperature is outside. There's no shortage of oxygen because there is always air flowing in through small openings, cracks, and two entrances. But as Mr Khapran says, "You have got to be careful all the time when you are inside."